Press Win + period (.) or Win + semicolon (;) to make the menu pop up. Hoorah! You can also press Tab/Shift+Tab to switch categories, and switch skin colors with the button on the top right of the panel. Previously, your best bet was to use the software keyboard to access the emoji panel – not exactly user friendly. 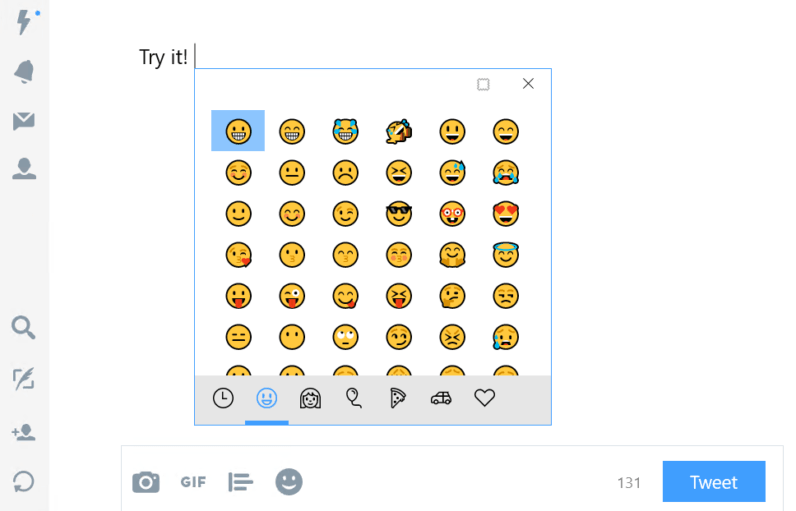 It may seem like a trivial addition, but emoji are becoming a bigger part of our daily communications, and there’s no reason I shouldn’t be able to communicate the same way on my desktop as I do on my phone. Keep in mind this feature is only available to Windows Insider on the Fast ring for now. Those of you on the Slow ring will probably get it in the coming weeks, and everyone else will have wait until the Fall Creators Update lands later this year. For more on the new features in the latest Insider update – there are a ton of them – check out Microsoft’s blog post at the source below.